The wedding season is here and what better way to celebrate it, than in your best sarees? Be it aKanjeevaram, Paithani, Bandhani, Banarasi, Pochampally, Chanderi, Phulkari, Nauvari, Pattu or aPatola, every saree is a true masterpiece. It is the workmanship it that exudes a brilliantly strikingappeal. The fabric, the weave, the texture, the patterns, each one exquisite and unique. To make aspecial occasion, even more special – perfect!While the sarees are designed with utmost care, it is important for you’re the, wearer, to take careto keep the saree looking as good as new. When it comes to washing or dry cleaning, every saree isunique and there needs to be treated basis the garment and the work on the saree.So, this wedding season, treat your sarees like royalty and don the celebrations in style. Our fabriccare experts will ensure you sarees and ethnic wear stay clean and look as good as new. So thatyour favourite and precious sarees maintain their shine and remain intact, while allowing you toflaunt them at every special occasion. We use the world’s best laundry and cleaning solutions to wash, we strictly do not use petroleumbased chemicals, as it is known to damage your fabric. We understand that every saree needs to be washed with special care according to the fabric.Hence, we separate the sarees before wash and carefully follow wash instructions. We know that over a period sarees tend to age. Post-wash we put your sarees through specialprocess to keep them looking as good as new. Not one but two experts check for the quality of wash before delivering it back to you. Regular ironing can cause irreparable damage to your sarees. 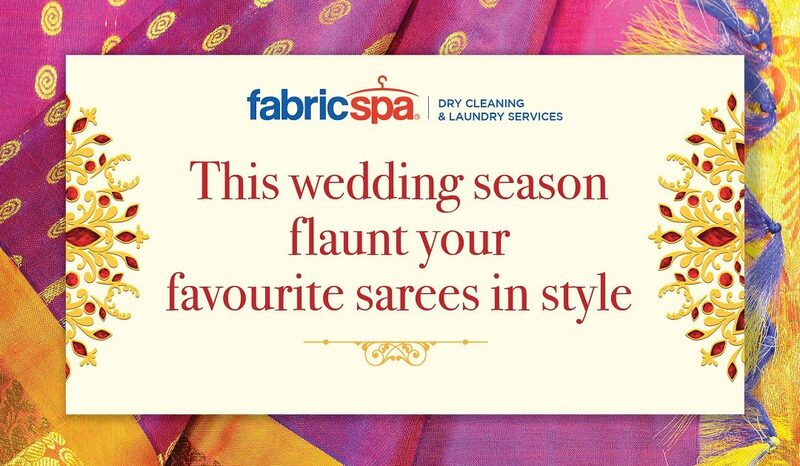 But at Fabricspa, we only use fabric-friendly roller steams to keep your sarees live longer. We take special care even during delivery of your sarees. All sarees are packed in special pouchesthat keep your sarees fresh, clean and ready-to- wear.So, why risk your elegant wraps to an ordinary wash when you can entrust them in the expert handsof someone who understands them and has the expertise to keep them looking stunningly fresh.Come, and get ready to share the spotlight this wedding season.We are the fabric care specialists, and follow a unique 9-step process to ensure that yourclothes live longer and look as good as new after every wash. Now, you can wear yourfavourite clothes more often and still keep them looking as good as new!